them the way nature intended? It’s a good question, and I think the answer is that someone came up with the idea of peach cobbler. Who ever this person is, is clearly a genius, and should have probably been given a noble prize. 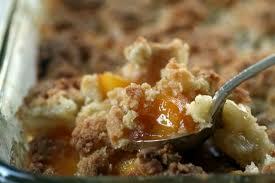 The great thing about a peach cobbler, is that it doesn’t hide the natural flavor of peaches, it accentuates them. And then add a ‘biscuit’ topping. And then sets the whole thing in a naturally flavored vanilla and peach syrup. It could be one of the best summer desserts, and that’s saying a lot. Peach cobbler is an easy dish to make, but does, unfortunately, required a bit of work. You can’t take shortcuts on this, it won’t turn out right. And don’t even think of using frozen or canned peaches. The time consuming portion is the process of blanching, peeling and slicing the peaches. It’s necessary to remove the skins. But trust me, the results are worth every minute of work. The biscuit is a simple recipe, and you can of course substitute my recipe for your own. Some call for buttermilk biscuits. I love buttermilk in most baking applications, but in this case, because the biscuits are cooking in the peach (and peach syrup), they don’t need ‘extra’ flavor. Being very simple works in their favor. They need to absorb and compliment the peach flavor. It’s a southern classic, and classics are classic for a reason. I hope you enjoy this as much as I do. Fill a large pot with water and bring to a boil. Have an ice bath ready. Using a pairing knife, score an x on the bottom of each peach. Drop the peaches into the water and cook for about 30 seconds, or until the peals begin to loosen. Using a slotted spoon or chinese spider, remove the peaches from the water and submerge them into the ice bath. When cool, peel and slice the peaches. Place the sliced peaches in a medium sized sauce pot and add the cup of granulated sugar. Add about 1 cup of water and the vanilla extract and cook over medium to medium low heat for 10 minutes. In a mixing bowl, combine all dry ingredients. Using your fingers, cut the butter into the dry ingredients until pea sized clumps emerge. Add the milk and stir until incorporated, but not smooth. Do not over work. Heat your oven to 425. Grease a shallow baking dish. Pour the sliced peaches and their syrup into the dish. Spoon the dough over the top. Evenly sprinkle the top with the cinnamon. Bake until golden brown on top, about 20 minutes.